Truly the World's Best Dish Cloth! Our dish cloth offers a unique construction providing superior durability and absorbancy! 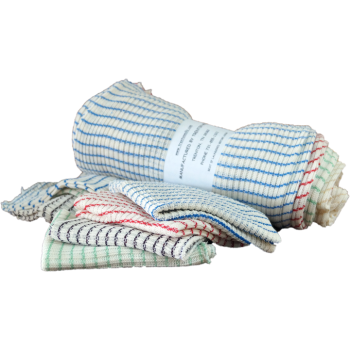 Perfect for washing, dusting or just general cleaning, Trenton Mills' dish cloths are ideal for any area. From kitchen, to shop, to car; the World's Best Dish Cloth earns it's name! Four colors per dozen! Each dozen will contain red and blue, while the other two colors are random and based on availability. Orders less than ten dozen will be rolled. All others will be flat-stacked. These are the best dish cloths! I got my first ones as a gift 10 years ago! I buy 12 dozen at a time and give them for gifts. I have friends asking if I have any when theirs wear out. I highly recommend them.